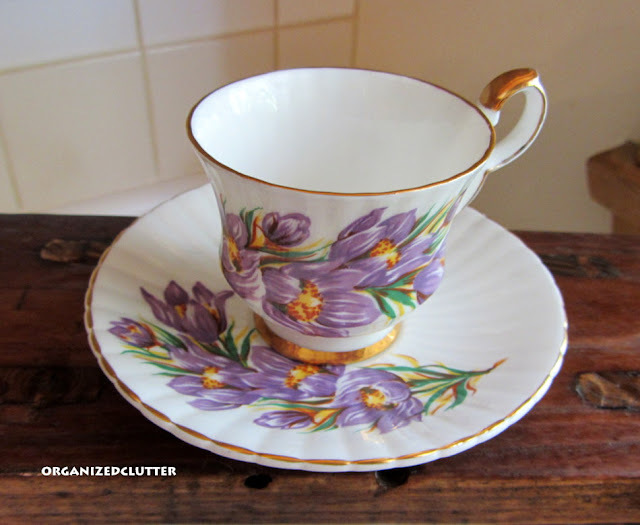 I am back to English bone china for today's Tea Time post, with a Royal Windsor demitasse cup and saucer in the Prairie Crocus pattern. I found this lovely just last week at a local consignment shop for a whopping $4. It really would be a perfect springtime post, but I can't wait that long to show you. The Prairie Crocus is the floral emblem of Manitoba. I didn't know that! I am going to spin the saucer around so you can see the whole lovely saucer pattern. Now that I have had over ten Tea Time posts, I have a confession to make... I have never ever had tea in any of the tea cups in my collection. I always use a mug for tea. I just admire my collection. I just changed this mantel when I re-painted the living room last spring. This was my non-holiday mantel for over 10 years. I never tired of the tea cups. 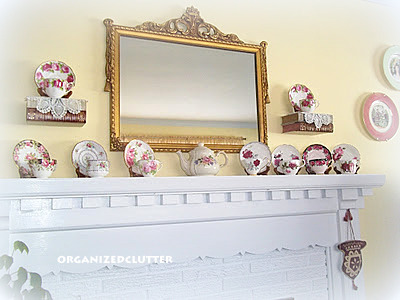 I love your mantel of teacups and how lucky you were to find that georgeous teacup for only $4. What a beautiful cup! It would fit right in with my collection! $4? Around here they go for $25-35--or more. So glad I inherited mine. I couldn't afford them otherwise. 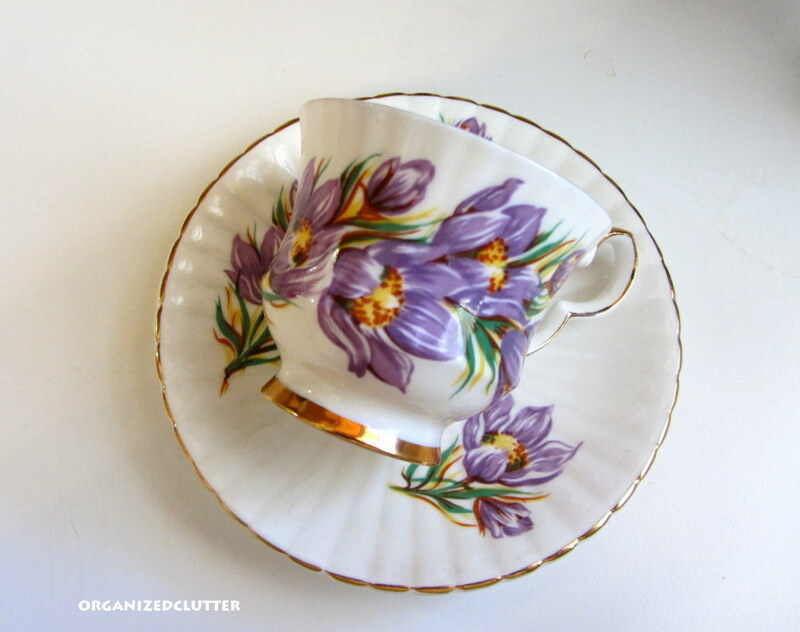 Carlene, your Prairie Crocus teacup is a sweetheart! Very pretty! Can't go wrong with the price either. I love your mantel! You have a lovely display of teacups on it too. Thank you so much for joining me for tea today and Happy Autumn! 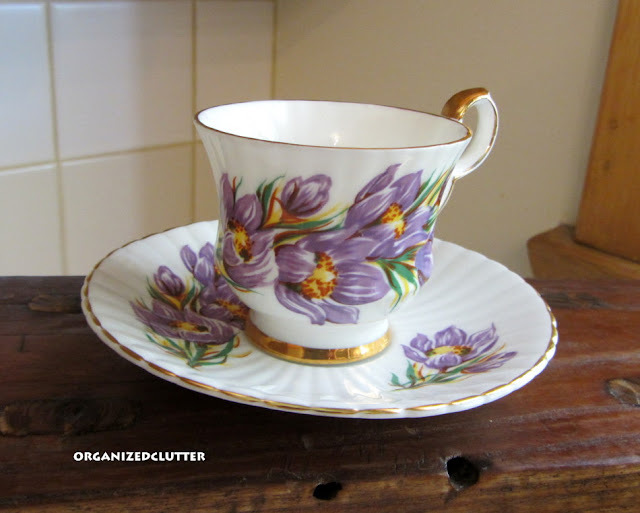 Since I live in Manitoba, I love the Prairie Crocus china! Your new teacup is pretty and worth sharing now. I think you should throw a tea party for a few friends and use some of the teacups. It's fun and a real girly party. You don't see too many crocus design teacups! How pretty! And I love your mantle. Beautiful! Thanks for sharing and linking to Tuesday Cuppa Tea! Hi Carlene, Your mantel is so pretty. 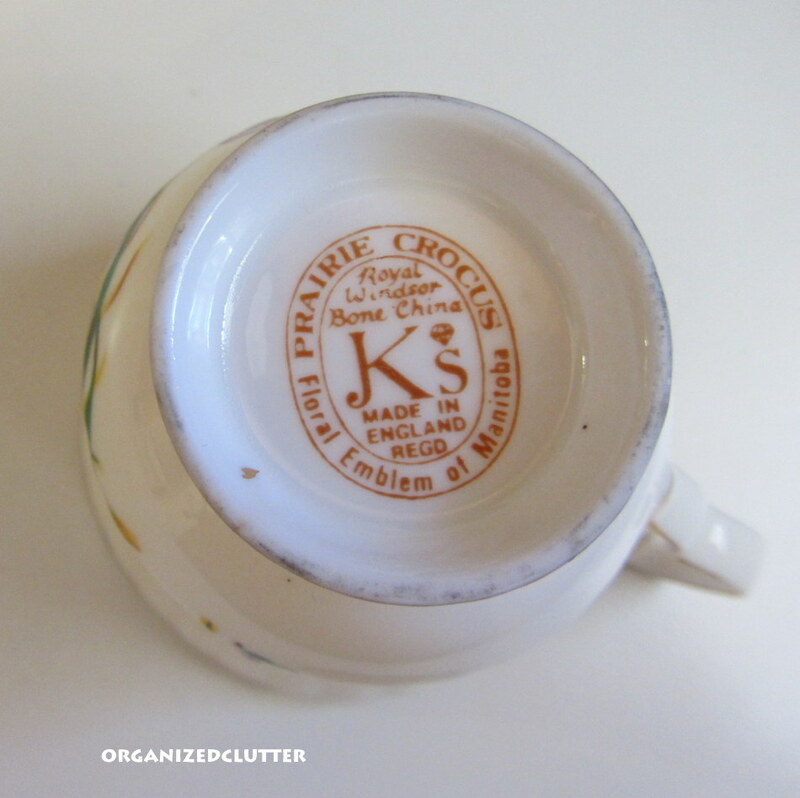 Love your new teacup; perhaps we can just say it's a fall crocus! Gorgeous! Your mantel looks so pretty with all of your tea things. Love your new crocus cup! Happy Tea Day! Gorgeous teacup and saucer. Your mantel of cups is beautiful, Carlene. The teacups look so beautiful on your mantle and I just love your new find. No reason you should get tired of these. They are timeless. They create a beautiful bit of the dramatic showing themselves off across the mantle like that. Like a little teacup chorus line. A demure chorus line, of course. Your tea cups are lovely! I love your fireplace mantel with the darling scallop trim! The teacups look so cute all lined up in a row. Your crocus teacup is so pretty! Hey Carlene... Super find.. for a sweet cup... It's very hard to find a crocus teaset so I think you've hit the jackpot especially with a $4.00 price tag. I have never seen this pattern before. What a sweet find. Your new Prairies Crocus tea cup set is lovely! What a bargain it was too! Your mantle looks amazing like that. I can see why you have never tired of it. Btw, tea in a paper thin porcelain tea cup tastes amazing!